Another impressive showroom that opened during Clerkenwell Design Week was the new space for progressive fabric brand, Ultrafabrics. However, this was not simply a move into London’s design district for the fabric specialists – Ultrafabric’s new space in the heart of Clerkenwell is also the company’s first international showroom. 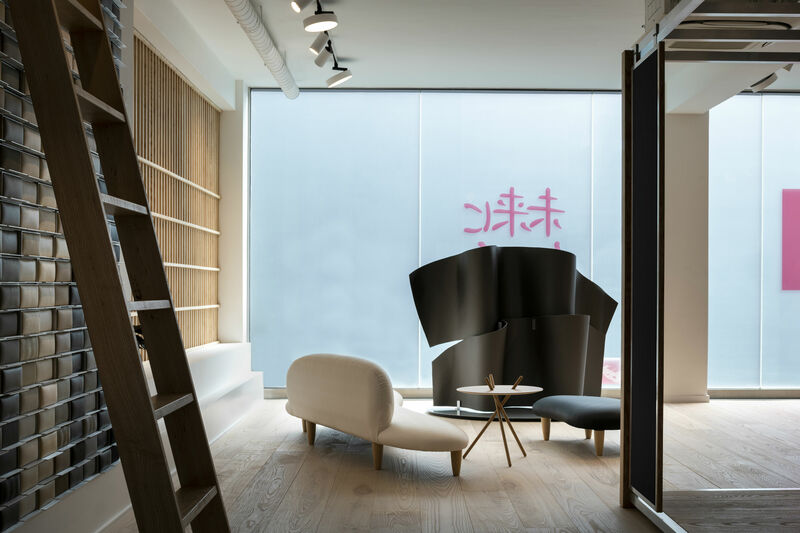 Developed by Danish international design powerhouse, OEO Studio, and creative strategist Teke Busk, the concept behind Ultrafabric’s first showroom was to “create an inspirational destination that pushes the boundaries of how fabrics are showcased and used”. The design draws on the natural environment, but gives the space an abstract twist, inspired by Japan. This Japanese influence reflects the brand’s heritage as a Japanese-American company, and has been created by zoning the showroom to offer visitors a journey, inspired by the four elements of nature – water, fire, earth and air. Bespoke elements of the showroom include the tactical art installations and furniture pieces that take further inspiration from Japan. Throughout the new showroom, high quality craftsmanship has been used, and the choice of materials range from crafted ash wood to aluminium. The most visually stunning element of the new Ultrafabrics showroom is the large wall of coloured shelves, which harbour samples of the extensive range of Ultrafabrics’ different materials and offer visiting designers the chance to sit and compare textures and colours, to find which fabric suits their project best. Serving as a stimulating, inspiring collaboration space for clients – as well as a new creative hub for the design community – Ultrafabric’s new Clerkenwell showroom is a welcome addition to London’s design neighbourhood. International office designers and furnishers, Bene, had another great Clerkenwell Design Week this year. 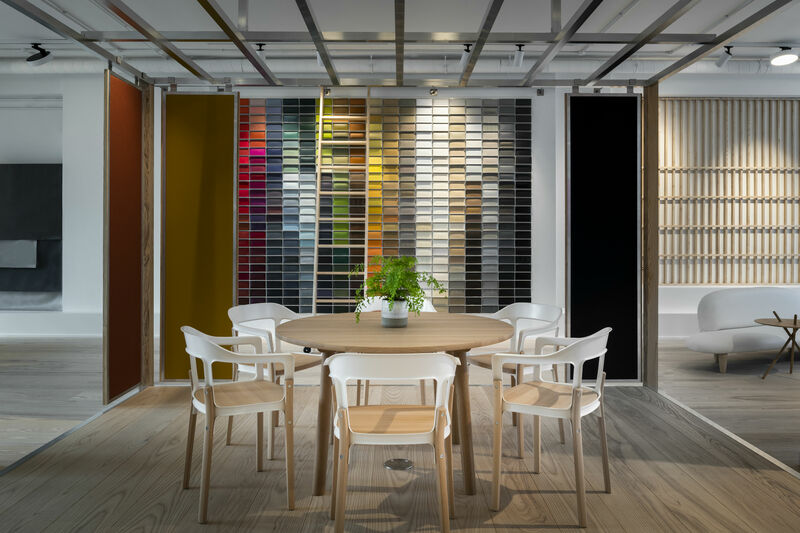 Dedicated to staying ahead of the latest trends and developments in business and society, the office specialists have turned this knowledge into innovative concepts and products, which are showcased throughout their bright, spacious Clerkenwell showroom. This year, as part of Clerkenwell Design Week, Bene also took their expertise one step further. The office furniture design company hosted a successful talk titled You’ll never work alone – Humanising the workplace, which saw a panel of behavioural science and design experts discuss how working environments will support our future needs. As well as this, Bene chose to launch their latest product, STUDIO, during Clerkenwell Design Week, with the new collection taking pride of place in their showroom. Forming an arrangement that supports individual work and lifestyle, STUDIO combines a table with storage, shelving and accessories in its clever design, making it useful for both the office and a home. Fusing the personal and professional also inspired Bene to create the “Double Top” – a double table top; this helps provide space for personal items and keeps things tidy. Bene developed STUDIO alongside Austrian product designer, Thomas Feichtner; a smart, sophisticated solution to the trend of combining private and personal lives, STUDIO is guaranteed to remain a triumph all year round. This year at Clerkenwell Design Week, ceramic surface experts Mosa collaborated with kitchen specialists, Grohe, to ask the question, what makes a house a home? Their answer: “Great design… [and] a considered, bespoke approach”. Both Mosa and Grohe have been working with architects and designers for decades to create the best possible solutions for their clients’ requirements. At Clerkenwell Design Week, the manufacturers took this dedication one step further, joining forces to reflect on the challenges and opportunities of contemporary residential architecture. Inviting all those who visited the Festival to join the conversation at the Mosa showroom, the two companies used Clerkenwell Design Week to discuss residential typology, the role of sustainability and overall design processes. 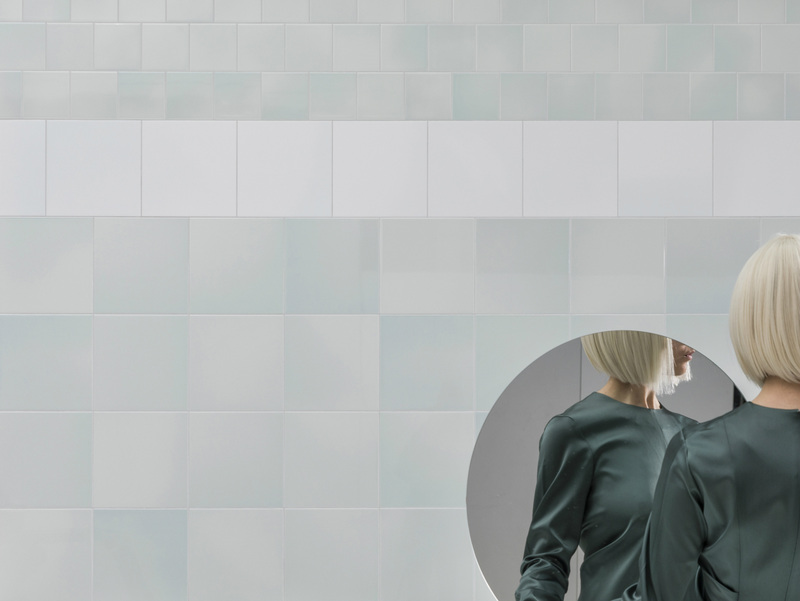 As well as their successful collaboration with Grohe, Mosa revealed their latest ceramic series at Clerkenwell Design Week – Murals Fuse. 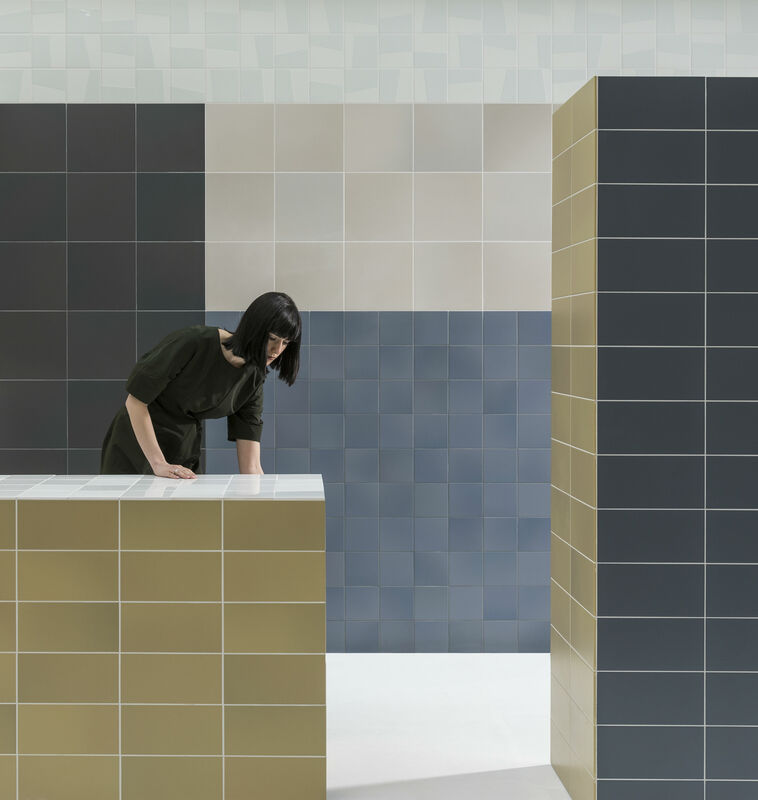 Offering a fresh approach in tile design and part of the award-winning Murals line, Fuse is a series of products spanning eight colours and three sizes. Ready to adapt to any design need, Murals Fuse hopes to transform architectural surfaces into vibrant works of art. As well as creating forward-thinking surfaces, ceramic specialists Mosa also seem to know how to throw a party. To finish off their successful Festival – and showed off their latest series – Mosa held an incredibly popular closing party on Thursday 24th May. A record breaking number of visitors attended the event – some of which were lined outside the door, queuing to join the celebrations.